David T. Valentine, History of the City of New York, 1853, pg. 291. 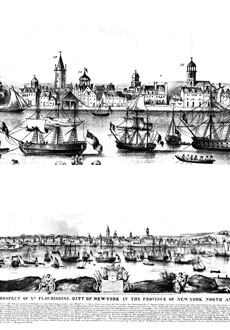 In 1664, the British captured New Amsterdam and renamed it after the Duke of York. The Dutch ceded Manhattan for the island of Run in Indonesia and the legal possession of Suriname. During the Third Anglo-Dutch War in August 1673, the Dutch recaptured the city and renamed it New Orange, but the signing of the Treaty of Westminster in November 1674 returned the city to English rule. This etching of New York, seen from across the East River, shows the city in 1717, when it was the third largest city in the British colonies; with a population of about 7,000, only Boston and Philadelphia were larger. The location of Wall Street is marked by the steeple of Trinity Church, the tallest spire on the skyline. No longer the northern end of the town, Wall Street had become the center of a bustling regional capital whose government met in the new City Hall (the domed building to the immediate right of Trinity Church). The many ships illustrate the city's active port. From 1717 to 1720 an average of 225 vessels used the port each year, trading goods primarily with Britain and the West Indies.